Has it become harder to raise money? is a question I hear all the time. On one hand, the total dollars invested by VCs is relatively flat at just under $30B per year, according to the NVCA. On the other hand, the stories of difficulty raising series As and Bs have become a steady drumbeat. To get some sense of the patterns, I analyzed 917 companies from seed through Series B over the past 14 years, using Crunchbase data. I’ve divided the companies into cohorts by the year they raised their seed investment. Click on the charts to view interactive ones. 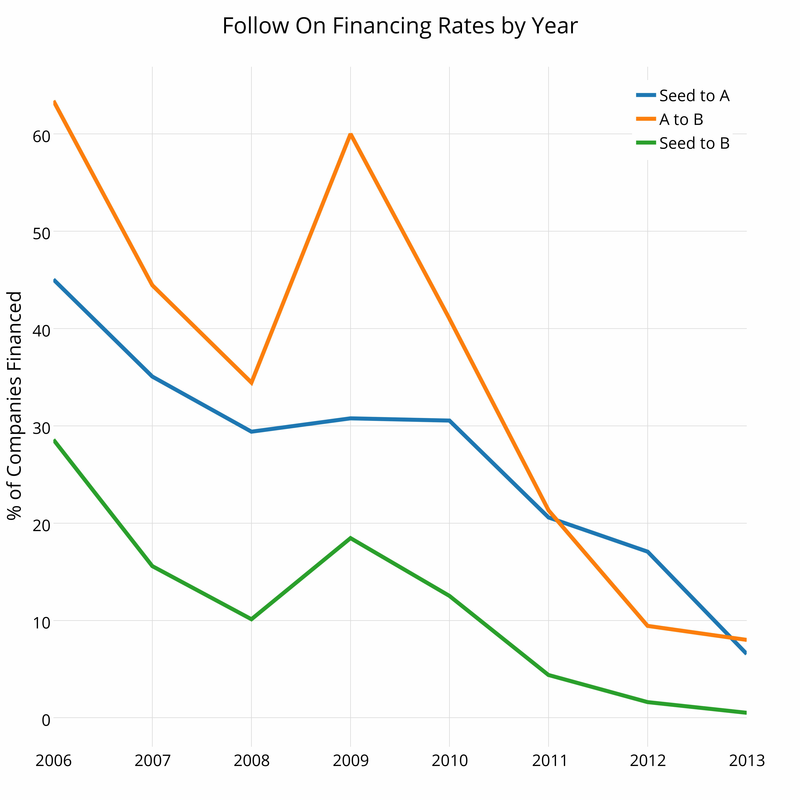 The chart shows the narrow funnel seed stage companies must pass through to raise a series A. There are three observations we can make from the chart. 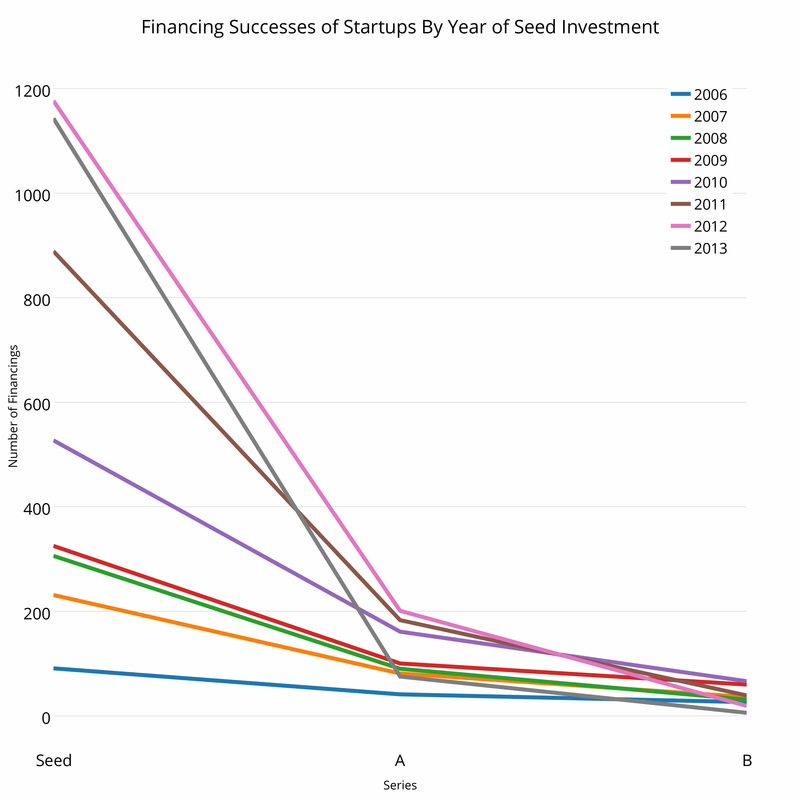 First, the number of seed investments in the Crunchbase data has increased by 4x in 4 years. Some of this growth is better data recording, but I suspect the majority of the growth is driven by increased seed investments. Second, the total number of Series As has also increased, but it’s hard to say whether that’s data accuracy or ground-truth. Third, the total number of Series Bs is remaining relatively constant, even for the newer cohorts, like the 2012 class. Across all these cohorts, the mean success rate to raise an A after a Seed is 27%, to raise a B after an A is 35%, and the whole way through the funnel, Seed to B, is 11.5%. Said another way, only 12% of companies who raise a Seed will raise a B. If you’re wondering how these trends have changed over time, this next chart will answer that question for you. The x-axis shows calendar year and the y-axis shows the % of companies that raised a round. The blue line shows the percentage of companies raising an A after a seed; the orange line shows the percent of post-Series A companies raising a B; the green line shows the percent of post-Seed companies who have run the gauntlet successfully to raise a Series B. The secular decline in all of these ratios screams of increased competition. According to analysis by my partner Jamie Davidson on typical periods between financings peaks around 9 months so the follow on rates for Series Bs should be accurate up until the 2011 class, which gives these startups more than 2 years to raise their B. Data from 2012 and 2013 will show lower success rates because most of these companies won’t be mature enough to be in the market for a B. Despite the noisy data, it’s reasonable to conclude the financing market has become more competitive, driven by an increase in the total number of startups raising seed capital and a relatively constant inflow of capital into venture capital.